Hi there!! I don't know about any of you, but I'm ready for the summer! I would Love to have this cold weather disappear already. NJ weather has been terrible - its beautiful and warm one day and the next day I have to have my winter coat on! What is going on!! Anyway....I've been trying to stay fairly consistent with my workouts for several months. I went back to Beach Body training programs and decided to give 21 day fix a try. I'm on my 2nd run through of 21 day fix and I love it!! I have skipped a day here and there when life gets in the way, but for the most part, I've worked out everyday. My weight hasn't really dropped much, but I feel the difference in my body. I feel slimmer and firmer in areas that weren't and I have so much more energy! I used to run, especially last year when I was preparing for my first Half Marathon at Disney, but during the winter it is difficult. I have a treadmill, but it makes too much noise and I don't want to bother my relatives who live downstairs. Hubby and I went to the gym a few times, but with baseball starting up that had to stop. I started feeling excited that the weather would get better because I really wanted to get back to running on the waterfront like we did last year. We went down there a few times in the past couple of months, but now that the weather is better we are trying to make it there everyday. It is difficult, especially with my son's baseball games but we are trying. We were even going after dark, which is nice since there aren't too many people out. We even make it a family affair by bringing baby girl along. She's old enough to keep up, we aren't that fast, and this way we don't skip our runs/walks. One of our issues is not being consistent, so when we start gaining speed and stamina we stop going for several days, and then when we get back it feels like starting over again. That is where I'm at right now. I used to jog a mile, sometimes a little over a mile without stopping and now I feel like I'm dying after a 2 minute jog! Its just awful! Now that HS baseball is almost over, I am determined to add running to my Beach body workouts. I have goals to be healthier, lose weight and run more races so here I go! Another thing I've been keeping up with to help with my fitness and weight loss goals is keeping a healthy diet. I'm back on Shakeology for breakfast and I love it. There are so many ways to make it so you won't get bored, and it fills me up and gives me the energy to get my day started. 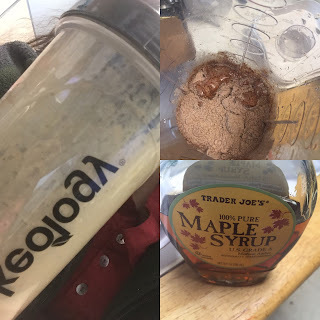 I've had it for lunch too but I prefer to make it my breakfast - especially since I need quick, on-the-go meals for breakfast! I've also been meal planning and prepping....so my snacks, lunches and dinners are all ready for me to grab & go! There is nothing to think about when it is time to eat. I'm currently tracking my weight on the Wii Fit....and this has to start dropping! LOL! So I have all this planned out, now its just a matter of staying consistent! Another goal which will also help me stay accountable and stick to this, is to help others. I've struggled for years and still struggle, but I feel that if I am able to motivate others to stick to their plans like me and we check in with each other, we will all succeed and feel great while crushing our goals! What are your health/nutrition/fitness goals? I would love to hear about your struggles and how you push through or if you have difficulty staying on track! Just comment below or contact me! This is sure to be a Great Active Summer!! !